This is yet another variation on the basic cupcake recipe. A handful of fresh or frozen raspberries and some white chocolate chunks added to the mixture make a colourful and tasty cupcake with a little more pizazz than the traditional version. You could just as easily add other berries or dark chocolate for other variations. 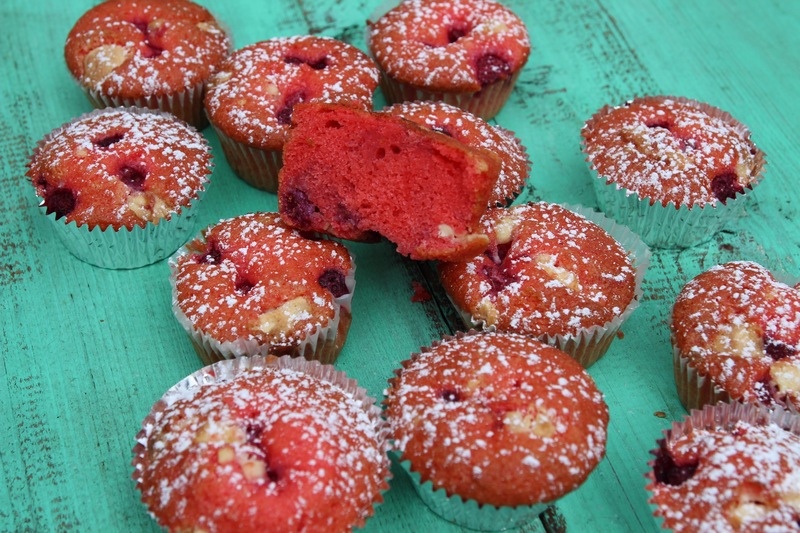 I like a vibrant cupcake so I add a drop of red food colouring to jazz up the mixture. Preheat the oven to 180 degrees C and line a cupcake tin or muffin tin with paper cases. Put all the ingredients except the milk, food colouring, raspberries and white chocolate in a food processor and blitz until smooth. Add the milk while pulsing to make a soft, dropping consistency. Add the food colouring and pulse to combine. Carefully fold in the raspberries and white chocolate. Spoon mixture into the cases, filling the cases equally. Place the tin in the oven and bake for 15 minutes or until the cup cakes are cooked and golden on top. Take the cup cakes in their cases out of the tin and cool on a wire rack. Serve as is or dusted with icing sugar. Posted in Cakes, Small Baked Things, Sweet Food and tagged cupcakes, rasperries, white chocolate. Bookmark the permalink.